Successfully Added USB Powered Cute Air Ionizer to your Shopping Cart. Apple shaped air freshener and purifier. This model helps purify the air around your desk, and can be used with your own favorite essential oil to leave the atmosphere around your desk clean and fresh smelling. This is a simple plug and play air purifier, you just connect the CVFR-K44 to your computers USB port and it starts instantly working. Then if you choose, add a drop of scented oil onto the cotton filter to get some fresh smell at the same time your work air is being cleaned. Through the release of negative ions, this unit reduces the growth environment necessary for bacteria and molds, thereby making the air around your desk cleaner and safer. 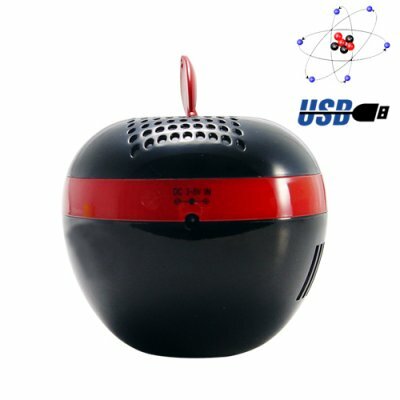 This Apple USB air purifier combines TiO2 photocatalyst, activated carbon filter and high concentration negative ions to adsorb harmful gas, smoke, dust, particulate and volatile organic compound to filter them out from the air or drop them to the floor in an inactive and harmless state. The Apple shaped air ionizer consists of a strong turban fan that creates a high air flow as much as 2.0 - 7.5 m3/h for excellent ventilation that ensures quality air purification, with its whistle sleep design you can actually leave the it on at night while you are sleeping. This new cool looking air purifier and ionizer gadget is in stock today so get yours toady at our astonishing low factory direct wholesale price while supplies last! Where is the Apple ionizer filter located?